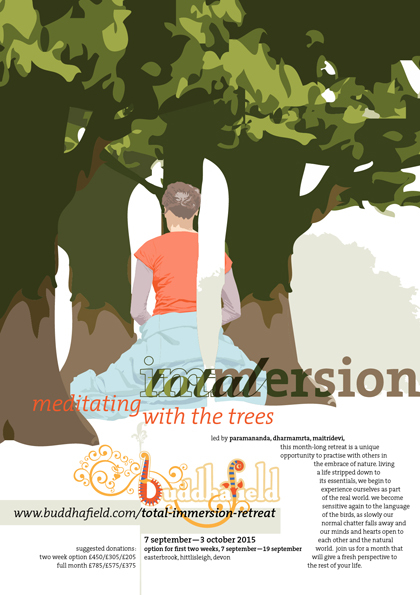 I was asked to produce a poster for the 2015 Buddhafield Total Immersion Retreat. This is an annual, month-long meditation retreat, camping in a lush part of the Devon countryside. 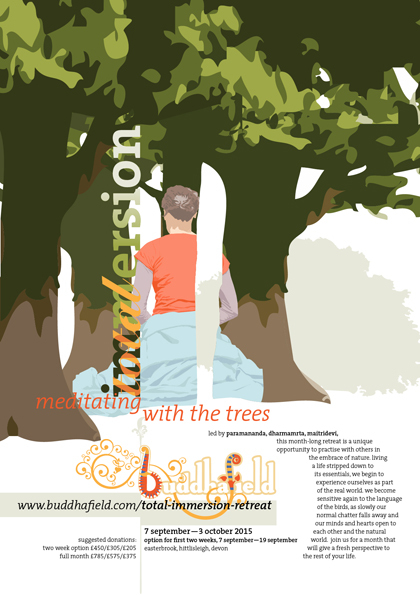 Living and practising close to nature is it’s key feature and the theme for 2015, “Meditating with the Trees”, reflects that very closely. 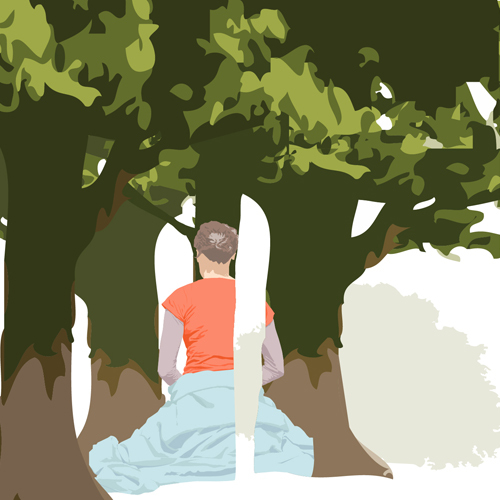 The theme of the retreat is illustrated by a surreal image of woman, back to canvas, meditating amongst a copse of trees. Inspired by the work of Belgian surrealist, René Magritte. 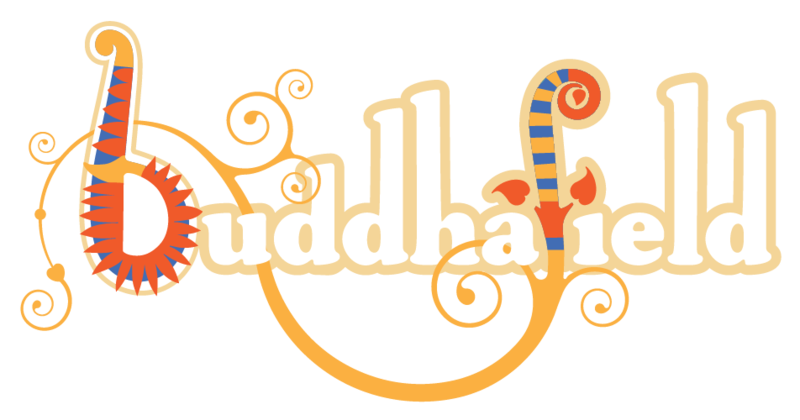 The structure of the title type sympathises with both the image and the theme. My immediate starting point was a painting by Belgian Surrealist Rene Magritte called The Blank Signature . It features a woman riding a horse through a wood. Magritte’s composition is an optical illusion which plays with the figure-ground relationship. Although in itself a fairly well known piece, the reason the painting stands out in my memory is perhaps a bit peculiar. In the early part of my art education I had a rather unsophisticated attachment to Surrealism. This was probably a bit stubborn because the Surrealists were highly unfashionable and I somewhat over-identified with them in passive resistance to the the influence lecturing team on my BA (Hons) Graphic Design course. However, that being the movement I knew most about (which wasn’t very much, really! ), it featured in an essay for an Art History module, where I discussed The Blank Signature in relationship to Salvador Dali’s Mae West . Having at that time a fairly strong disdain for Art History (which I’m happy to say I overcame), I put pretty minimal effort into the essay. The truth was that I made it all up as I went along, pretty consciously inventing a spurious argument about the relative meaning in order to make myself sound clever. Perhaps ironically, it didn’t help my relationship with the lecturer when I received a first class mark for the piece! Alternative version of the Retreat poster. This was an attempt to draw a closer visual relationship between the type and the trees, further playing with figure-ground. My personal painting and drawing style is immensely detailed, made up of many fine marks. But however much I find that approach pleasurable, it’s something of a compulsion and in many ways rather limiting because of the resulting complexity. It’s curious to note, though, that the work that most influences me isn’t in itself necessarily highly detailed or complex. I’ve always looked to the work of comics illustrators Hergé (Georges Remi), Moebius (Jean Giraud), Albert Uderzo, and latterly Mike Mignola as the peaks of my drawing aspirations. So I’ve had to work at economy of line and flat areas of colour: this often evokes the essentials of an image more immediately, whereas I’m prone to getting somewhat lost in the details. Of course, the flat colour approach also harks back to fine art and graphic design history. Although in retrospect my degree’s Art History module seems lacking in depth (now knowing much more about typographic history), my respect for the Beggarstaffs, E McKnight Kauffer, and A M Cassandra stems from there. In this case I was particularly thinking of Kauffer’s famous series of posters for London Underground and London Transport. The development of lithographic printing is rich with works designed in flat or graduated colour and intense line, but contemporary Web graphics also leans very heavily towards vector art and fields of saturated colour, so I aimed for a sympathy in past and present technique. My type decisions, however, originated in a completely different period. At about the time I started this poster, I’d begun collecting back issues of various graphic design periodicals including Eye , Baseline , Emigré , and Graffik . Starting to read these from the earliest numbers and working forward, I ended up looking at a lot of early 90s typography. This is of course the same period I was first studying Graphic Design (I graduated in 1992), where the desktop publishing revolution was being waged against the limitations of Letraset and paste-up. Although much early 90s graphics could be said to have descended into structural anarchy, the ability to distort, outline, overlay, and intersect type is still exciting. Thus I was inspired to immerse the word “total” and reflect the illustration in words. Personally I put a great store in the use of the typographic grid. To some extent working within it’s linear constraints can be both a support and challenge. The underlying geometry should almost force an adequate composition, but the inherent boxiness can become to obvious when there’s a substantial element of text to place coherently. To mitigate against that in the centre of the bottom third I added a circle as a grid line. that softens the flow and adds a nod towards organic form of the treeline. Font families used are TheSerif (part of Lucas De Groot’s Thesis super-family), Cooper and Snell Roundhand.